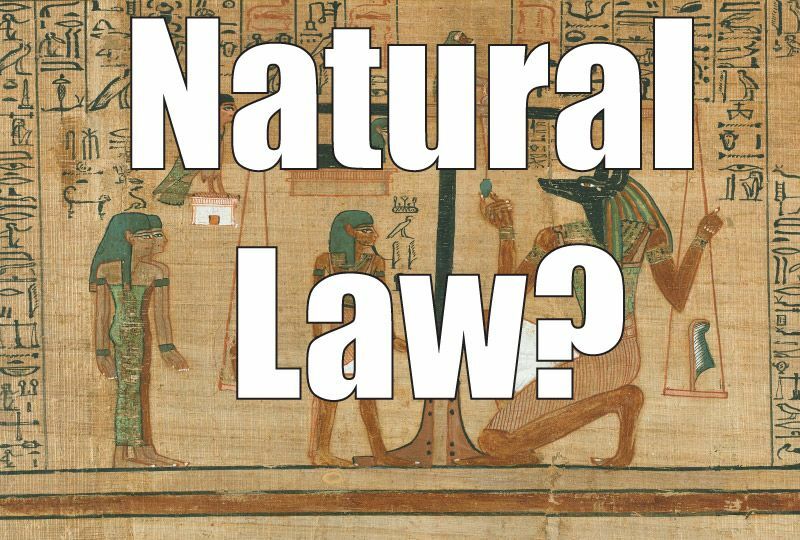 Is There a "Natural" Law We Can Recognize? “Natural Law” is generally a term used to refer to a basic moral understanding developed by living with others. It’s a natural understanding we develop in life. We understand some things as right, some things as wrong, and it can be objectively understood despite an individuals inability to comprehend how. We may use the words right and wrong in different ways, and also fail to distinguish right from wrong, and say something is right when it’s wrong, or wrong when it’s right. But those are limitations of the individual subjective consciousness’s inability to objectively discern the difference. When you’re too attached to yourself, that will subjectively blind you to an objective appraisal of reality, because reality isn’t just you who gets to do whatever you want, to harm others physically, or defraud others with clever schemes. A failure to recognize objective morality is the problem of the individual consciousness, not of objective morality being indiscernible or not existing at all. The audio has an additional 7 minutes for the supplementary infographic explanation. It’s natural in the sense that these are intuitive understandings that we develop naturally through cooperative survival optimization, instead of trying to live as an island alone and doing everything alone where you don’t need to have any concern for others to survive. If there is no one around to be affected, there is nothing to be concerned about and you can do whatever. These understandings of how to act are natural developments in behavioral causal reciprocity. If beings are looking to optimize and cooperate, morality will become recognized, if not consciously, then it’s an amoral comprehension that follows intuitive causal stimulus processing to arrive at non-contradictory responses on how to behave for cooperative survival. Before abstractions of ideas, concepts and language, there is an intuitive understanding based on a causal reciprocity. Cause-and-effect, stimulus-response. When an animal species interacting with others of its own kind, or others of another kind (within the larger kinship of the animal kingdom), there is a reciprocal interchange from one causal agent to another, where certain behavior on the part of one, will be a stimulus upon another agent that will trigger a response. Each individual’s desire to survive and not be harmed will result in a reciprocal interchange to maintain that status of self-existence. If another individual attempts to harm our natural tendency to survive, we respond in defensive means to retaliate against threats to our being. It’s cause and effect. This is all natural in how we respond to stimulus that is a threat to us. Of course, causal agents can choose to not defend themselves, can be a victim, can take a beating, etc. A consciousness agent can choose to do nothing when they are being abused or harmed. And some causal agents can’t defend themselves to harm being done. But a natural response is to recognize harm being done to ourselves, or to others. We recognize patterns, repetition, and develop an understanding of what is right by recognizing what is wrong. Learning about harm, what is wrong, is an apopahtic process of not doing things. At a lower level of arrangement, construction, coordination and organization, there is the non-organ, non-psychological, non-animal dimension of only base biological responses from stimulus the environment provides. Animals have this as well, since we are also made of basic biological factors that have evolved to be more complex, yet work similarly. Biological things (from plants to animals, humans included) have causally stimulated responses, “programmed” genetic behavior, and epigenetic influence to affect individual differences in evolution. The organization and construction of atoms, molecules and larger constructs, enables a more sophisticated interchange within its own construct (electro-chemical), but also with reality on a more active-response basis (growth, decay, etc.) compared to inanimate matter that only engages in chemical reactions as a sophisticated interchange. The biological level has a biological life to sustain for growth until it decays, and some plants have programmed responses to threats to its growth potential. This basic bio-nature level is the first type of “life”. 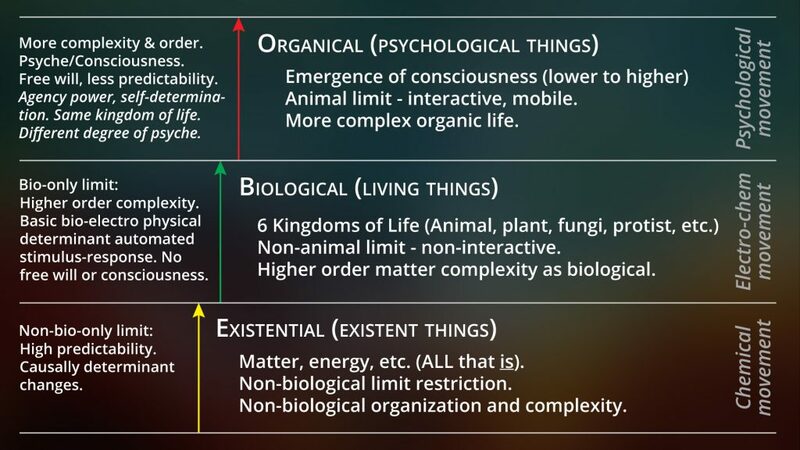 Higher biological coordination and organization produces actual organs in “organisms”, which is the realm of the animal kingdom that diverges from simply being biological animate matter of the first type of basic “life”. The animal kingdom develops into the complex organization and formation of neurons that establish the basis for more self-directed epigenetic evolution. Psychological life emerges. Choices can be made. Interaction increases and mobility is a usual requirement. The organic (due to organs, etymologically, not simply biological like plants), are the animals which have the psychological dimension that emerges due to the neurons developing. This allows greater agency in the world through a variability in choices to engage in different behavior due to increased mobility and interactive capabilities. For example, a rock does nothing, it can only be affected by external causal forces like wind, water etc. or other forces in order to make it change, erode, etc. A plant has more capability to causally affect reality, as it has basic input-output stimulus-response programming to grow, and then it decays to affect reality. A rock does not have that level of activity or time factor. A rock does not have stimulus and response adaptability. Further, the animal kingdom, the organical and psychological, is higher than simply being biological. The animal kingdom has greater interactivity and even greater ability to affect reality. Since we are also biological, we decay as well in time, and last less long than plants, such as trees that can live for hundreds of years or more. Each successive arrangement, coordination and organization of the components in existence evolve to create more complexity and more emergence of new functionality and capabilities. A rock has the least, plants have more, and animals have the most, with humans having the most capacity to alter and affect the reality around us. That was just to explain how the development of complexity can be categorized and how there are 2 main levels of processing: 1) the bio-nature level (i.e. biological-natural), and 2) the organical-psychological level. I am explaining how we come to recognize stimulus from our environment in a psychological causal agent dimension. Actions from consciousness come from a causal agent that creates causes actively, not accidental actions alone that are simply manifesting through other causal forces acting upon it to stimulate a response according to basic laws of causality. This is all naturally developed. Whether subconsciously, unconsciously or intuitively understood through a basic information processing at the psychological level, or whether it’s a conscious awareness of what all of this recognition of behavior means, to call it by the concept morality, “natural law”, or anything else. Put groups of animals together to survive cooperatively, and this will come about naturally through the ability of consciousness to be with-knowledge (which is the etymological meaning of consciousness). This isn’t to say they live morally. They don’t understand what it is or how to do it more. It’s just a basic understanding that comes from cooperative reciprocal interchange and activity to optimize survival. The fallacious ideology of “might makes right” often wins out over objective morality. I’m just pointing out how at a basic level cooperating is understood to some degree, and this forms the basis for what later develops into the morality of our behavior towards others, the “natural law”. I also mean putting animals that can exist together without inherently fighting, like the same species or species that won’t eat each other to survive. Although, in some cases predators have protected prey in the wild and have become friends. This is the psychological dimension overriding the basic bio-natural instinct to survive by eating anything. That shows the power of consciousness in other animals. Humans can better understand this intuitive compatibility that develops from understand each other as ourselves, and not harming another as we respect them for not harming us or others as well. If they violate that trust to not harm us or others, then they no longer get afforded the respect of cooperative reciprocal survival. They are violating that inherent intuitively understood trust, loyalty and faith. The actions and behaviors of others are objective facts in reality. They happened. The affects of actions on reality can be measured to certain extents. We process that information, and can respond accordingly. We can respond in rational objective ways to reciprocate survival optimization. If others want to play dirty, break the rules, and try to harm or defraud others through deceit, falsity, manipulation, etc., then they are breaking the reciprocal survival behavior to maintain that trust. The psychological dimension allows for greater interactivity and creative affect upon existence. Consciousness has greater power to affect, alter, modify, manifest, generate and create into existence. This is only a basic understanding of morality or “natural law”, and how it starts. I have more work in the future. I have a lot of understanding on this topic that can be demonstrably explained for you to verify in life. Understanding the meaning of words is crucial, as I emphasize in a lot of my previous work. You’ll notice I don’t use the term “natural law” because of this confusion in understanding the word natural, which I have already covered in part before.